Floating in deep space with the city's protective shield failing, the team must do all they can to keep Atlantis alive. Meanwhile, a radical injury threatens Dr. Weir's life. A Stargate needs to remain in a relatively fixed location in space in order to be able to successfully dial out and connect to another gate. If a gate is located on board a ship — including the city of Atlantis — the city must more or less come to a stop (or at least not be moving too quickly) in order to dial out or receive an incoming wormhole. This is consistent with the use of Stargates on board ships in past episodes, including Stargates placed on board Goa’uld motherships (SG-1: “Within the Serpent’s Grasp,” “The Serpent’s Lair”). Upon fleeing from Lantea, the city’s destination for its new home was M12-578. The planet has no preexisting Stargate. 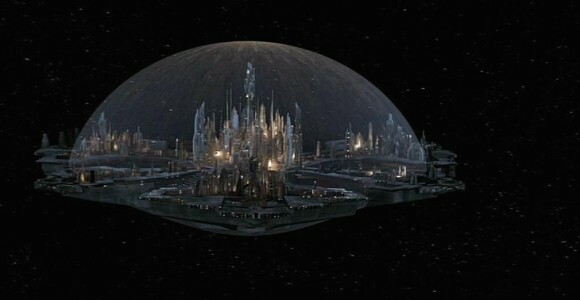 Atlantis is capable not only of generating an air-tight protective shield as a bubble around the entire city — it can also restrict that shield to cover only a part of the city, or down to just the central command tower. This is far from ideal, however, as it leaves unprotected areas exposed to the vacuum of space while the city-ship is in flight. Atlantis’s automated systems will automatically collapse the shield down to the central tower when power levels reach a critically-low level. Atlantis requires a minimum power level in order to open a hyperspace window, and has safeguards to prevent the city from doing so when its power levels are too low. If the safeguards are overridden, there is an estimated 50 percent risk that the city would be destroyed upon entering the hyperspace window — indicating that the power requirement is necessary to maintain the hyperspace window at a sufficient size and/or duration, or to power the city’s protective shield as it enters the window, or both. The Replicator homeworld, visited by the team nearly a year ago (“Progeny”), is designated M7R-227. Elizabeth Weir – On the brink of death, Elizabeth’s life has been saved thanks to extreme measures taken by Rodney McKay and Jennifer Keller. The two used the dormant Replicator nanites still in Weir’s system following her exposure last year (“The Real World”) to reconstruct the cells of her damaged organs. Unfortunately, there was not enough time to program the nanites to assist her body in creating new organic cells; instead, her body was repaired using replicated, inorganic nanites — leaving Elizabeth part Replicator, potentially for the rest of her life. Elizabeth herself is against the plan, though there is little she can do about it — and she has been completely healed, even having her hair rapidly regrown following a decompressive craniectomy. John Sheppard – With his friend and base commander Elizabeth Weir out of commission, Colonel Sheppard had to step up and take command of the city of Atlantis at one of its most desperate hours. With a never-ending series of crises, Sheppard remained cool-headed and — after a private talk with McKay — in control. Jennifer Keller – Dr. Keller has been forced to deal with a major medical crisis under extreme circumstances. When Dr. Weir was critically injured by the Replicator satellite weapon, Keller led her medical team in keeping their leader alive, even performing a radical decompressive craniectomy and using Replicator nanites that are beyond experimental. She did all of this under the threat of impending demise for the entire city of Atlantis, and with much of her medical staff away on board the Apollo. Samantha Carter – Carter has recently been working to get Earth’s Midway Station operational, alongside Dr. Bill Lee. Following the news that Atlantis has been lost while fleeing from the Replicator satellite weapon, Sam has decided to travel to the Pegasus Galaxy and try to find the city. Bill Lee – Dr. Lee has also recently been assigned to help bring the Midway Station online, alongside Samantha Carter. But the station’s lack of gravity proved trying, with Bill getting a severe case of nausea. He has joined Sam on a mission to locate Atlantis in the Pegasus Galaxy. Will the team be able to infiltrate the Replicator homeworld and return with a Z.P.M. … before the city’s little remaining power runs out? Will Dr. Weir recover from her injuries? What are the long-term implications of having Replicator nanites replacing cells in vital organs? Is she vulnerable to being influenced by the Replicator collective, despite McKay’s precautions? Will Carter and Lee be able to locate Atlantis? “As episodes go, I have to say these [‘Adrift’ and ‘Lifeline’] are some pretty neat ones. Again, visual effects-wise they’re huge, and they also set the tone for the rest of the year. This is very much a season of change, and they’re dramatic changes. We’ve got some new faces on the show as well as some old ones, and we see then interacting, but on new levels. VOTE! How would you rate Atlantis's "Adrift?"